Food - You Should Visit Japan! Food! A subject near and dear to everyone's heart. 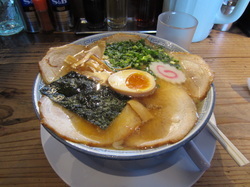 Japan is famous for its cuisine. At the same time, there is much more to it than sushi. We'll help you with guides to Japan's food culture, and how it varies between regions. If you have food allergies, don't despair. You won't go hungry during your journey. Make friends, eat well! Staying at a hotel, but want to enjoy a home-cooked meal? Check out the highly-rated Nagomi Visit! As a bonus, all the hosts speak English (to varying degrees, naturally), and some speak other languages as well. A great way to make friends and share cultures! Can't wait to eat sushi in Japan? Going out for sushi this weekend? Here's a handy guide (which I stole) detailing the intricacies of dining out at a sushi bar in Japan or in your town. Hopefully this will help you enjoy the food and experience more, and avoid any cultural faux pas.